A section of Vista off Sycamore Avenue that’s known today as Green Oak Ranch was, from 1935 to 1941, the location of Camp Vista. The camp was part of a nationwide network of facilities operated by the Civilian Conservation Corps. The corps, known more familiarly as the CCC, was one of the first programs instituted by the administration of President Franklin Roosevelt to relieve massive unemployment in the depths of the Great Depression. At its height the camp was home to 200 enrollees, unemployed young men between the ages of 17 and 28 who were put to work on projects involving soil conservation, tree planting, preservation of wildlife habitat and road building. That’s some history worth remembering. 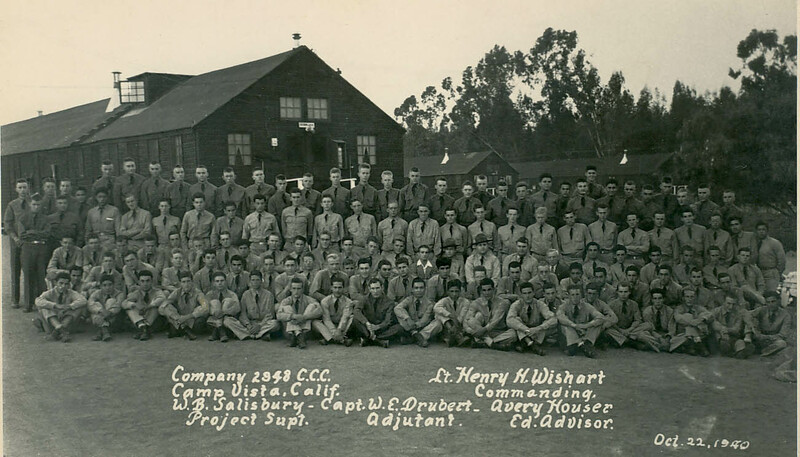 Sources for this post included the archives of the Vista Historical Society and the book, The Tree Army: A Pictorial History of the Civilian Conservation Corps, 1933-1942.